Have you noticed the beautiful pup who graces the cover of our VMX 2019 Official Program Guide? He’s Hopper the Great Dane, and besides being a gorgeous representative of his breed, he has a very special backstory that will warm your heart. 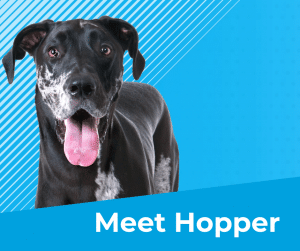 Hopper is owned by Sam Stewart, American Heart Association Training Coordinator at All Care Health Services, and Chrissy Stewart, owner and CPO at Tropical Sky Orthotics and Prosthetics. Sam told us all about Hopper’s incredible journey — a tale worthy of a feature film. Sam said, “Hopper was the product of a ‘backyard breeder,’ but because he was born missing his front right foot and the lower portion of that leg, he was not able to be sold. Apparently, some neighbors noticed that this little three-legged puppy was being left outside and neglected, and convinced the breeders to surrender him to a rescue. He was surrendered to Great Dane Love of Central Florida (GDLCF), underweight and covered in fleas. Hopper was then placed in one of the rescue’s foster homes while rescue staff consulted with veterinarians on what to do with him. Many dogs with this type of physical abnormality would simply have the remainder of the limb amputated and learn to function as a tripod. However, this can be trickier with a Dane, as they are a giant breed, and carry most of their weight in the front, and so would be at a great disadvantage in having to support that weight all on one front limb. The rescue staff started to wonder if a prosthetic leg would be possible for this pup, and began making inquiries. While this sounded like a good idea, there are not many practitioners who do this for animals, and the ones that do are well beyond any rescue budget. Fortunately, a friend of a friend of the rescue knew that my wife, Chrissy, was a practitioner and owned her own orthotics and prosthetics company, and reached out to her to see if she might be able to help. Although Chrissy had never worked on animals, she is an animal lover, and has especially always loved Great Danes. She agreed to donate her time and materials to this dog, in the hopes of making a functional prosthetic. Chrissy made Hopper’s first prosthetic leg when he was 4 months old. As soon as we put the leg on him and stood him up, he immediately took off running around, as though he’s had the leg forever. It still amazes us how incredibly adaptive animals are. Ironically, when Chrissy first started working with Hopper, I told her not to fall in love with him, as I was definitely not interested in ever having a dog. But then I went with her to fit his new leg and I (the “not a dog person”) fell in love and knew we had to adopt Hopper. This ended up being the ideal situation because Hopper has grown quite a bit and has had to have his legs adjusted and remade along the way. Living with the person who makes his prosthetics is perfect. Again, the production and maintenance would be incredibly expensive otherwise. Hopper is now 4 years old, fully grown at 120 pounds, and is on his 6th prosthetic leg. He does have some arthritis in his back legs, which is common in the large breeds, but would likely have been much worse if his gait was not so well aligned with his prosthetic. At this point, as he is ‘middle aged’ for a Dane, he is as energetic and active as any other dog. After I discovered my love of Danes, we adopted a second one from the same rescue, and now we also foster Danes through the rescue, so we always have three in our house. Hopper runs and plays and keeps up with every one of them. He can certainly outrun us, and pretty much any other dog he meets. He loves to be in the water, playing in the ocean or lake, and has very few limitations. What a wonderful example of how animals can inspire humans… as they do every day! NAVC’s Joe Stern explained the connection to discovering Hopper as the cover model. Hopper’s story is a great tie-in to the local Orlando community, and brings the NAVC tagline, “Your Veterinary Community,” to life. In fact, we decided to make him our website home page model as well, at NAVC.com. Let’s celebrate Hopper along with all the animals you treat who thrive against the odds and who reflect the true meaning of community.